No other thought or pursuit is as important right now as the soon-coming Kingdom of God. Some time ago, a friend of mine died. I visited him in the hospital just a short while before he lapsed into an unconsciousness that will be broken only by the resurrection (I Corinthians 15:51-52). His last words to me were, "I hope to be in the Kingdom soon, Mr. Tofts." It is the hope of God's Kingdom that keeps God's people strong. Through all the storms and disappointments of his hurly-burly thing we call life, the hope of the Kingdom — the hope of membership in God's perfect, joyous, immortal, governing Family — is the anchor that keeps us firm. Jesus Christ said: "He who overcomes, and keeps My works until the end, to him I will give power over the nations — 'he shall rule them with a rod of iron'" (Revelation 2:26-27). And again, "To him who overcomes I will grant to sit with Me on My throne" (Revelation 3:21, Luke 1:32-33). And, "We shall reign on the earth" (Revelation 5:10). John wrote: "I saw thrones, and they sat on them, and judgment was committed to them … and they lived and reigned with Christ for a thousand years" (Revelation 20:4). Thus the ultimate hope of a Christian is God's Kingdom! But we humans are not the only ones looking forward to the wonderful world tomorrow. God also eagerly anticipates the Millennium. Jesus Christ said it would be God's "good pleasure" to give us the Kingdom (Luke 12:32). God is pictured as a loving father eager to give the cosmos to his sons and daughters. Thus, incredibly, we are the undeserving heirs of a Kingdom that will last forever (James 2:5, II Peter 1:11). This is the promise that God gives to those who are members of His one small Church. And it is — by far – the greatest opportunity that can be given to a human being. It far surpasses in importance any other facet of life. No other ambition, goal or desire is anywhere near as important as the chance to become an immortal child of God and rule in the world tomorrow! It is time now for this hope of God's everlasting Kingdom to be put before every other interest (Matthew 6:33). And what a hope it is. Picture a world completely at peace (Micah 4:3). Imagine young people learning responsibility and outgoing concern for others as they grow into adulthood developing their talents to the full. Think of a world without famine, disease, crime, broken families or war. Think of the wonderful accomplishments such a society could achieve. It is the picture — the vision — of all these things that enables us to weather the storms of life. 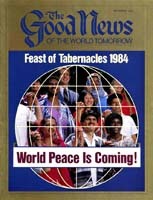 In his book Tomorrow — What It Will Be Like, Pastor General Herbert W. Armstrong gives an inspiring glimpse of the Millennium: "The living Christ is coming in all the power and glory of almighty God, as King of kings and Lord of lords (Revelation 19:11-16) to put down the rebellion of warring nations (Revelation 17:14), and establish God's world-ruling government over all nations (Daniel 2:44, 7:9, 18, 22-27, Isaiah 9:7)." Jesus Christ, the King of kings, with perfect character, absolute in honesty, integrity, faithfulness, loyalty and trust — filled with outgoing concern for the governed, for their welfare and their salvation — having total knowledge, understanding, wisdom, complete love, mercy, patience, kindness, compassion, forgiveness. Jesus Christ, possessing total power, and never compromising one millionth of an inch with His perfect law, God's government on earth, compelling haughty, carnal, rebellious humans to yield in complete submission to God's government. No one will then be deceived. The vast majority of mankind is today. All will know the truth. No more religious confusion. Humans will become teachable. People will live God's way – the way of outgoing concern for others — the way of true values — the way of peace, of happiness, of well-being, of joy. Conflict, sickness, pain and suffering — gone. Poverty, ignorance — banished. Smiles on people's faces – faces that radiate. Formerly wild animals tame. Air pollution, water pollution, soil pollution — gone. Crystal pure water to drink; clean, crisp, pure air to breathe; rich soil where unproductive deserts, mountains and seas formerly were, producing full-flavored foods and fantastic beauty in flowers, shrubs, trees. If you would like more information about what God's Kingdom will be like — if you want more details, straight from Scripture, about the wonderful world tomorrow — request a free copy of Mr. Armstrong's book Tomorrow — What It Will Be Like. "Where there is no vision, the people perish" is the inspiring thought in Proverbs 29:18 (Authorized Version). How true that proverb is! That's why we have to be continually pointed toward the Millennium. We must think of the Kingdom always, talk about it with others of like mind and forsake it never. All of us should now be extremely mindful of the Millennium. We should be able to picture it inside our heads, as it were, in glowing technicolor. We should be able to hear it, so to speak, in stereophonic, nay, quadriphonic sound. It should be so real to us, given as many exact details as the Bible reveals, that we could almost, as it were, reach out and touch it. If it is not real to you yet, have patience with yourself, but make sure you listen attentively at services at the Feast of Tabernacles and to Mr. Armstrong's radio and television broadcasts. And read Mr. Armstrong's two books Tomorrow - What It Will Be Like and The Incredible Human Potential, and his booklet Just What Do You Mean... Kingdom Of God? This important literature will help you clarify and fine-tune your picture of the future. All are free for the asking by writing to our office nearest you. See the inside front cover for a list of our addresses. Now, at this very late, last-minute stage of events, the soon coming Kingdom of God should be the No. 1 thing on our minds. By comparison, nothing else is important. All else comes in a distant, poor second. Emphatically, the hope of and training for the Kingdom must now be the central focus of our existence as true Christians. Even if, like my friend, we have to face the gates of death, our last thoughts should be of God's Kingdom, God's Kingdom — and God's Kingdom.